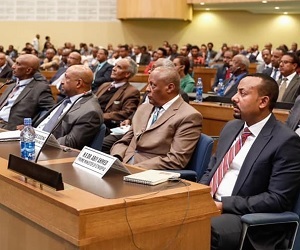 Ethiopian Parliament approved today the appointment of 40 candidates to the position of Identity and Boundary Commission Members, and they all took oath before the parliament to serve the commission with integrity. 22 members of the parliament voted “no” while 4 members abstained. Legislation to establish Identity and Boundary Commission was ratified in the parliament on December 20, 2018. The Commission is tasked to study conflict causing and controversial Identity and boundary issues in the country, and propose recommendations, that are expected to resolve conflict, to the office of the Prime Minister and House of the Federation. Of the nine regional states in the country, Tigray regional state passed a decision recently rejecting Federal legislation, approved in the parliament, to establish Identity and Boundary Commission. The region is facing identity questions over Wolkait and Raya, likely to be among the top issue to commission. Members of the commission appointed today are drawn from politicians, academics, prominent figures and former senior government officials. Two former presidents of the Federal Republic of Ethiopia, Dr. Negasso Gidada and Dr. Mulatu Teshome, are appointed to the commission. “The main thing is that the Commission will work based on the Constitution,” said former president Negasoo Gidada in a video published today by Fana Broadcasting Corporate (FBC). He added that he believes he could contribute to the works of the commission for he was involved in drafting the constitution and executing it. In terms of politicians, Aregawi Berhe, Professor Merera Gudina, Andargachew Tsige and Lencho Letta are appointed to the Commission. The parliament has also approved candidates proposed to be members of National Reconciliation Commission. Individuals who claim to have worked on the idea for a long time are criticizing Prime Minister Abiy Ahmed’s administration for sidelining them.